It’s not possible to predict the future so having adequate insurance is one of your best defences to guard against life’s uncertainties. 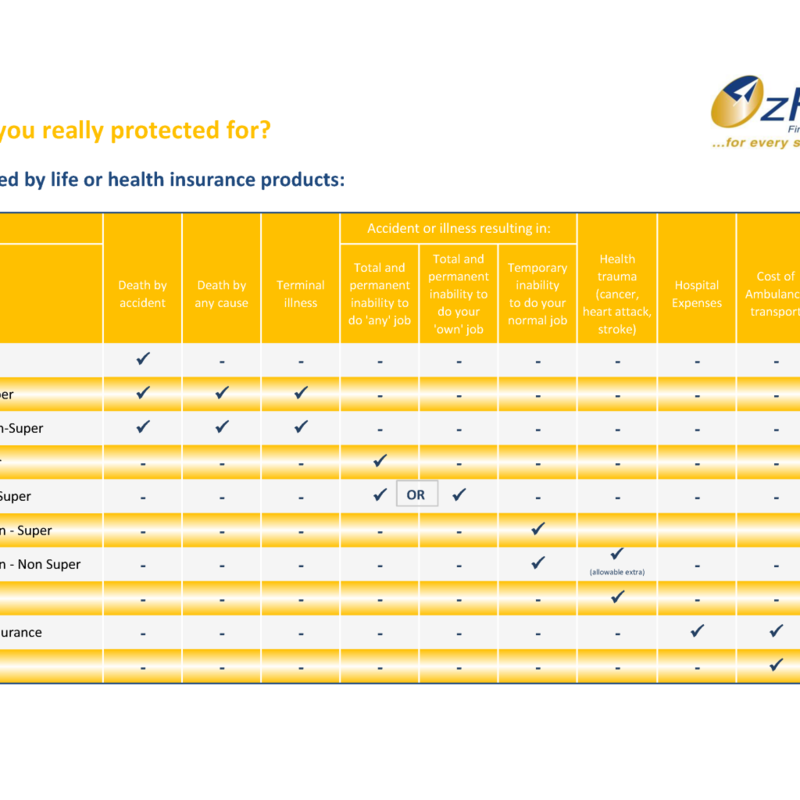 OzPlan understands how important it is to protect yourself and your family against unfortunate events such as accident, illness, disability or death. It is important to ensure you and your family receive the financial support needed. The harsh reality is that in the event of an accident or illness leading to death or permanent disablement, many Australian families would not receive a large enough payout to cover even a year’s income. An estimated 80% of people would only have enough cover to last up to 5 years of replacement income. 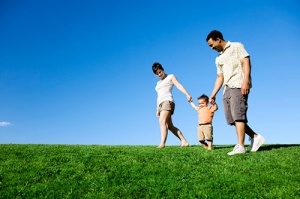 Today it is more important than ever for families to take steps to protect themselves financially. With increasing levels of mortgage, credit card and other debt it is critical for Australian families to protect themselves in the unfortunate event of an accident or illness. 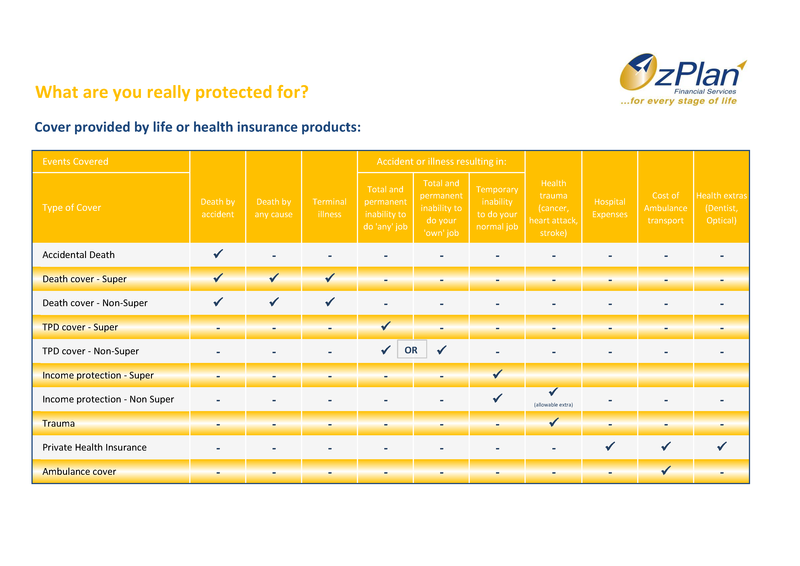 Personal Insurance – can you afford to take the risk? Trauma cover pays a lump sum upon the diagnosis or occurrence of a specific illness or injury such as heart attack, cancer or stroke, etc. Trauma insurance is designed to give you money when you need it most. It is the more expensive personal insurance, however it is the one that’s most claimed upon and that’s reflective in the cost! An example of this– if you were to suffer from cancer and were to be off work for a couple of years due to treatment, stress etc, your life insurance would not pay out, your TPD insurance would not pay out because you will return to work one day, however your trauma insurance would give you that lump sum payment to ease the financial pressures of not working. Life insurance protects those who depend on your pay cheque. If you die prematurely, life insurance provides your dependents with a lump sum of money that can support their living costs. It can also provide a timely emergency fund for medical, legal and funeral costs should family savings not be adequate to cover these expenses. TPD insurance pays a lump sum benefit in the event the life insured is completely disabled and unable to work again as a result. A serious injury or illness devastates both the person who is affected and their family mentally and financially. TPD insurance can reduce the financial burden. Child cover pays a lump sum equal to the amount you insure your child for, if your child dies or suffers from a specific trauma cover condition. Some of the conditions commonly covered include brain damage, cancer, meningococcal, severe burns, meningitis, major head trauma, loss of a limb or loss of sight, hearing or speech. Trauma insurance for children is not about cashing in on your child’s misfortune. The proceeds can not only improve your child’s quality of life after suffering a serious condition, but it can even help to save their life. If your child was to suffer a life threatening illness covered by your trauma insurance policy, those funds can be used to access the best medical care that is available anywhere in the world. Income Protection pays up to 80% of your income if you can’t work because of sickness or injury. If you’re not able to work for health reasons, your ongoing expenses aren’t going to change. You’re still going to have to meet rent or mortgage repayments; household expenses, school fees and other regular commitments. And on top of that there are probably expensive medical or rehabilitation bills to pay. *Importantly. Do not buy Risk Covers by phone or online. You may be sold cover that is inappropriate to your circumstances. Take the opportunity to use the experience of our Financial Planners who will advise you face to face on the most appropriate cost effective and appropriate cover for you. The following situations are examples of clients of ours who have been financially supported by personal insurance plans in times of need. Ben was a 30 year old male in a well paying occupation that earned $150,000 per annum when he was diagnosed with chronic fatigue. He qualified for a claim under his income protection policy for a monthly benefit of $9,375, payable up until age 65 if he was deemed unable to return to work prior to this time. Upon the unexpected death of Linda, her spouse James and their children were paid a lump sum of $700,000 from her super fund life insurance policy. With careful planning the insurance payout was adequate to fully repay the mortgage on the family home and cover the family’s cost of living including the children’s’ education needs. 42 year old Simon was motor bike riding with his 11 year old son Will. Sadly Will had an accident and suffered a severe head injury. Thankfully Simon had Child Trauma attached to his own Trauma insurance policy which meant that he was paid a lump sum of $50,000 immediately. This lump sum was used to replace Simon’s lost wages as he had to take considerable time off work, unpaid.